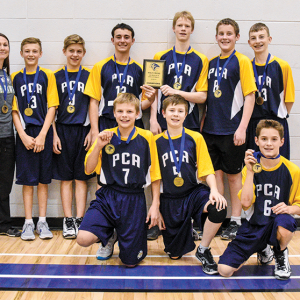 Three Hills School Jr. A Girls volleyball team took first place finish at the Holy Cross Collegiate tournament in Strathmore. The team finished first in their pool and then won their semi-final and final with grit, determination, and team work! Pictured (l-r): (top row) Stacey Hainstock (Coach), Ashley Ferguson, Kylie Robertson, Taylor Vaughan, Braelynn Rosgen, Shauna Vaughan (Coach). Bottom row: Kadence Smithson, Annika Ferguson, Malia Van doren, Lauren Boles. 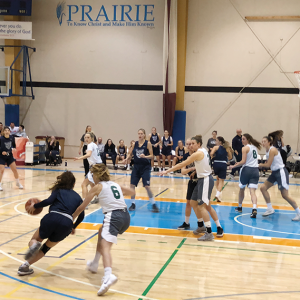 It was an evening of fast paced high level basketball at the Rick Down Athletic Centre on Thursday evening as the University of Alberta Pandas took on the Mount Royal Cougars basketball team in a Showcase Exhibition game. The teams played five ten-minute quarters with the score re-setting to zero after each buzzer. While Mount Royal played hard, their northerly rival took all five quarters. 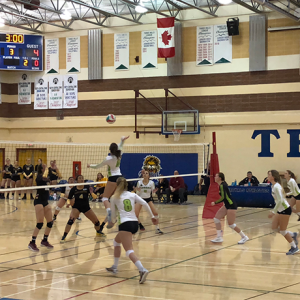 The Three Hills School hosted another ACAC showcase, this time between the home Red Deer College Queens and the visiting Olds College Broncos women’s volleyball teams. While Olds opened the scoring, the Queens soon showed their skill and gained an early lead in the first set, a lead the Broncos were not able to overcome.